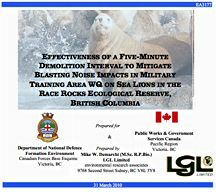 Noise from explosions at the Bentinck Island Demolition Range at Canadian Forces Ammunition Depot (CFAD) Rocky Point has the potential to disturb pinnipeds (seals and sea lions) hauled out in the Race Rocks Ecological Reserve (RRER). Such disturbance is prohibited by the Marine Mammal Regulations (MMRs) under the Fisheries Act and may be inconsistent with the conservation interests and economic goals of other stakeholders. Previous research (Demarchi et al. 2008) suggested that by extending the interval between projects (demolitions) in a run by up to ~5 min, the probability of disturbing sea lions to the point of vacating a haulout was diminished. Accordingly, the objective of this research was to determine whether spacing projects within a run by at least 5 min amounted to an effective means of mitigating the adverse effects of disturbance on sea lions within RRER. Using observational methods consistent with previous DND- sponsored research by LGL Limited at Race Rocks, pinniped behaviour in RRER was monitored in response to demolitions on Bentinck Island during three training courses during autumn 2008 and 2009. Data collected since 2002 were included to bolster sample sizes, as appropriate. Study results for Harbour seals and California sea lions are presented, but hypothesis testing focused on Steller sea lions due to a number of considerations, including their conservation status, abundance at RRER, and higher sensitivity to disturbance. A total of five hypotheses were tested. First, analyses confirmed that Steller sea lions are sensitive to disturbance and that blasting causes increased activity levels and movement off a haulout. Such movements appear to be short-term with little or no consequence for longer-term use of RRER by the species. Second, there was no indication that by spacing the first two blasts of the day a minimum of 5-min apart that the reaction of Steller sea lions was notably different than in cases where blasts were spaced closer in time. Third, the maximum displacement during any given day of blasting appeared to be independent of the minimum blasting interval during the day. Fourth, the difference in number of Steller sea lions hauled out at the end of the day as compared to the beginning of the day appeared to be independent of the minimum interval between blasts during the day. Finally, as expected, the responses of Steller sea lions to blast noise is related to noise level, with louder blasts tending to cause greater levels of disturbance. Despite the foregoing, the evidence to date suggests that it is doubtful that blasting is having adverse effects on the population of Steller sea lions that use RRER. Assuming that demolition training in WQ is to continue, there are three remaining options to consider: seasonal timing windows for blasting, habituation of sea lions to blast noise, and range relocation to an alternate site on Bentinck Island or to the Whirl Bay Underwater Demolition Range. For reasons explained in the text, the Christopher Point Ordnance Disposal Range does not constitute an acceptable location regarding any attempts to mitigate blasting noise impacts on pinnipeds in RRER. Monitoring of the effectiveness of any alternate site at reducing sea lion disturbance should be conducted prior to any final decisions on range relocation. The risk of pinniped disturbance in RRER will persist as long as explosives are detonated in WQ when pinnipeds are present. The key challenge is to achieve a balance between the needs of military training and sea lion conservation. As a species of Special Concern and on Schedule 1 of SARA, and considering the content of the existing and proposed MMRs, conservation concerns surrounding Steller sea lions are likely to remain constant or even grow in the future, regardless of whether or not population-level effects occur as a result of military operations in WQ. Options to address this situation are presented.